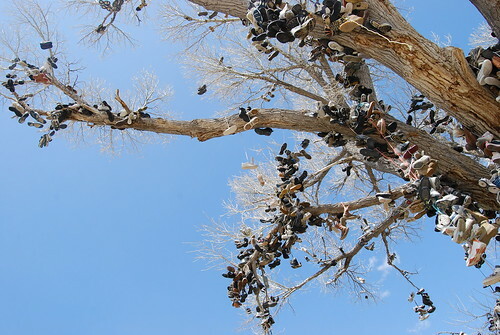 In 2008, I blogged briefly about a leg of one of our road trips across the Western US and included a bit on "The Shoe Tree" in Middlegate, Nevada. 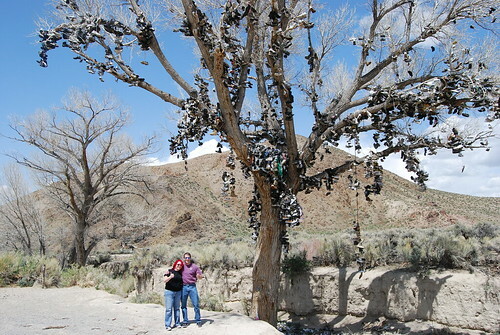 Ron and I discovered this roadside oddity on October 10, 2004, the day before our first wedding anniversary. We love the geography and geology of the Western States and take off down the road every chance we get. 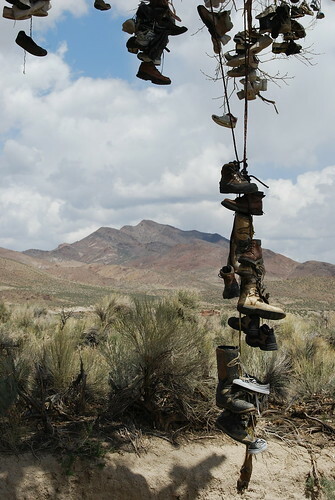 On that day, we were driving "The Loneliest Road in America," the portion of Highway 50 that roughly parallels the Pony Express Trail, from Silver Springs to Ely, stretching the width of Nevada. 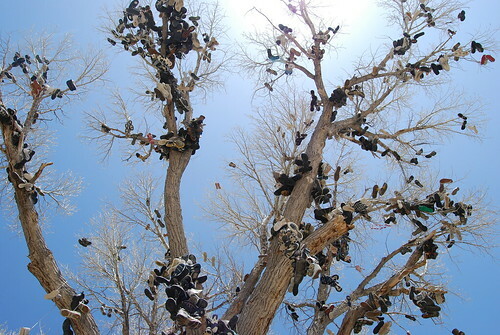 Located in almost the EXACT middle of nowhere, we saw an unusually large cottonwood tree that seemed to be sprouting shoes between the leaves. 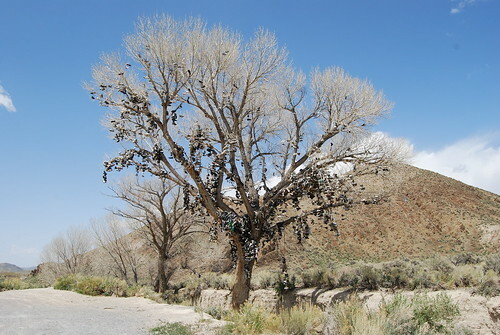 The Middlegate Shoe Tree (we researched it when we returned home) stood for many decades, the last three of which were spent covered in shoes, as a perfect example of roadside Ameria. 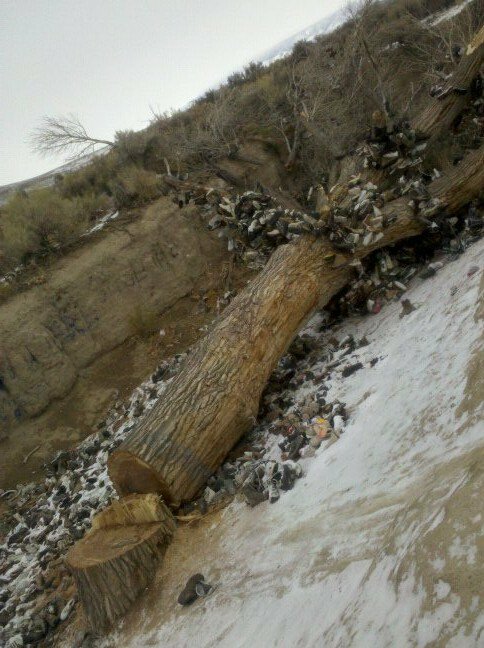 I was saddened to hear today, in a text from Ron, that vandals cut this landmark down in the middle of the night on December 30th. I don't know what else to say, so I will leave you with Ron's comments. 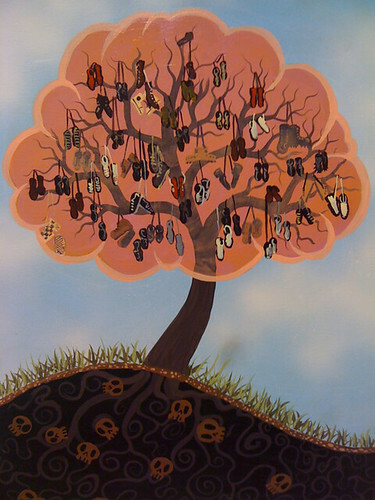 This was one of my favorite things from all the travels my wife and I have done on the road in America. It simply captivated everyone who drove by it–they all invariably turned, stared, stopped, and came back to look and take a photo with it. I got to see it twice–once in fall and once in the spring. I even had friends do paintings of it which are on my office wall. I guess I should feel lucky to have seen it at all…. What purpose other than to be hateful and destructive does this serve? I’m sure these people will go on to commit other crimes against animals and children. The type of mind that conceives of taking this kind of action is the type that moves all to easily on to other acts of pure hate and destruction since they take pleasure in the pain of others. 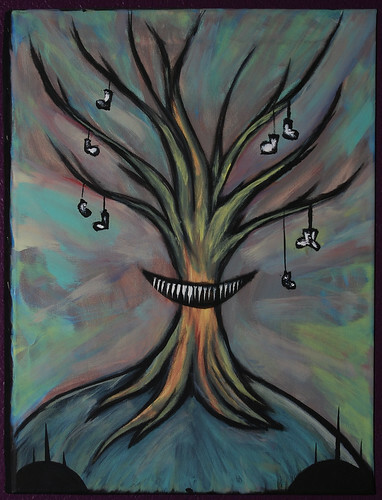 I saw this story the other day on the news and was reminded of you and ron and the painting that Nick made for you. Such a sad and weird story that someone would take the time to vandalize this tree. What a strange and wonderful thing in the middle of nowhere . 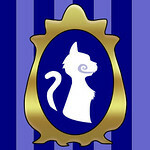 . . and very sad that someone thought it was there decision to take it down.